Filmmakers Jon Alpert and Matthew O’Neill discuss the relationship between East and West, the challenges of shooting in Turkey, and what they learned about the Turks while filming the program. WIDE ANGLE: In “Turkey’s Tigers,” we see a portrait of Islam not often depicted in American media. What do you hope American audiences will learn about modern Turkey from this film? Jon Alpert and Matthew O’Neill: Too often we think of the so-called Islamic world as an impenetrable block of indistinguishable nations — painted with the attitude that “East is East and West is West and never the twain shall meet.” But in modern Turkey East and West are always meeting each other at all sorts of strange and surprising angles. Whether it’s the high-fashion “Islamic” look you see on the catwalk in our documentary or the close political ties Turkey has to both the United States and Iran — modern Turkey is not easily classified. Turkey is often described in the American media as a model of democracy and secularism in the Muslim world. In fact, the state keeps close tabs on religion, seeing it both as a threat and a potential social cement. All mosques are run by the government. Around 99 percent of Turks are Muslims (mostly Sunni with a substantial Alevi-Shiite minority), but the country’s secular establishment, including the courts and the military, has sought for decades to restrict Islamic influence, which some political leaders view as an obstacle to Western-style modernization. Under Turkish law, women are not allowed to attend schools and or work in public buildings wearing headscarves. Even wives of ministers are excluded from government functions and formal state dinners because they wear headscarves. The ruling Justice and Development Party, which has its roots in the Islamic movement and has dominated parliament and local government since elections in 2002, has made no secret of its desire to lift the ban on head scarves. Both Islamic and secular leaders are using the rhetoric of freedom to push forward their ideas, with one side demanding religious freedom to wear headscarves in public places, and the secularists fighting local government efforts to restrict alcohol use. The overriding question: Will Turkey stay in an eternal state of suspension, tense between secular Europe and the Islamic Middle East? Or will it eventually tilt definitively in one direction? We think that in this film audiences will see that there is probably some third way for Turkey — somewhere in the “twain” zone where East and West are blending — especially in business. Politically influential, pragmatic and devout — Turkey’s Muslim entrepreneurs offer many parallels to pious Christian businessmen in the United States — and there’s no simple way to categorize either group. 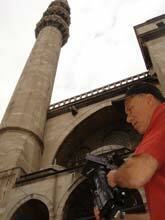 WIDE ANGLE: You’ve both spent your careers shooting documentaries internationally, from Cuba to China to Iraq. What are some of the particular challenges you faced while filming in Turkey? Jon Alpert and Matthew O’Neill: According to Turkish law, no public employees can go on record with the media without permission from some place above in the bureaucracy — this can make setting up scenes at schools or any public buildings (or interviewing a street-sweeper) a somewhat Kafka-esque adventure. It is also virtually impossible to get access to anyone in the Turkish military — and the military plays a substantial role in the Turkish state. 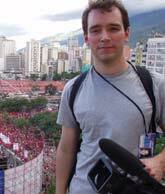 Producer and director Matthew O’Neill with his camera while filming a project in Caracas, Venezuela. WIDE ANGLE: The film profiles businessmen at the heart of modern Anatolian Tiger economy. What is the role of women in the business realm of Turkish society? Jon Alpert and Matthew O’Neill: In the board rooms of Istanbul women seemed to be fairly well represented — but their role in the booming businesses of Kayseri was almost non-existent. Though the Turkish economy is dominated by men, things did appear to be slowly changing — especially at the top of the socio-economic scale. A number of businessmen in Kayseri whose wives wore the headscarf and stayed at home, had daughters whom they hoped would get involved in business — whether they wore or did not wear a headscarf did not seem to make a difference. In Istanbul where there was a more established secular tradition, women were much more likely to take an active and visible role in business. WIDE ANGLE: Deputy Prime Minister Abdullah Gul seems to embrace democratic freedoms, but critics accuse the AKP of quietly re-introducing an Islamic government to Turkey. How receptive was the Deputy Prime Minister to participating in the documentary and did you feel that he was an open subject? Jon Alpert and Matthew O’Neill: We were extremely privileged to have a great degree of access to Foreign Minister Abdullah Gul as he made room in his busy schedule for us to spend an extraordinary amount of time with him and his family. He had invited us to his country house at one point — and we were disappointed that his busy schedule shuttling (at the time) between Washington, Moscow and Tehran prevented that from happening. But generally he was open and warm with us. He is very proud of what he believes the AK Party stands for and has accomplished — and very proud of his native Kayseri.